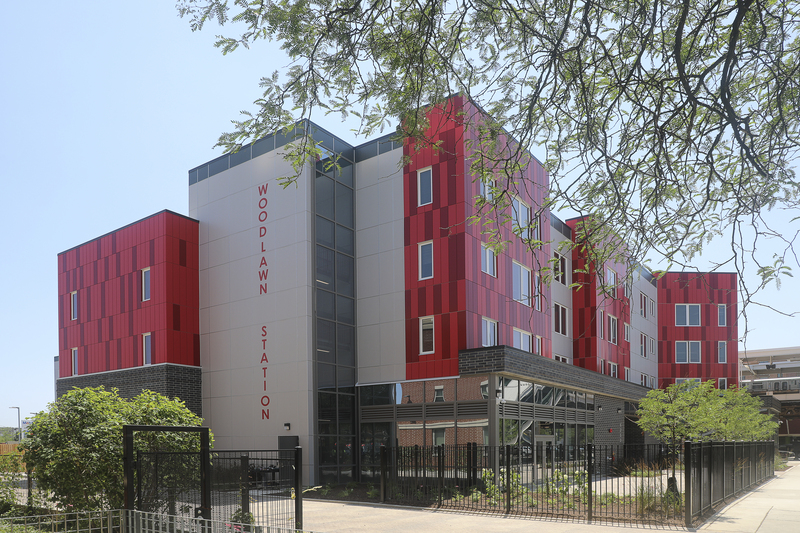 Skender, serving as base building and interior construction manager, recently completed Woodlawn Station, a transit-oriented affordable housing development in Chicago. Located just under the Cottage Grove Green Line CTA terminus station in Chicago South Side neighborhood Woodlawn, the mixed-use development features a main building that contains 55 units and two additional nearby buildings containing 12 and 3 units respectively. Occupation has begun in the 55-unit building and the 3- and 12-unit buildings will be completed at the end of this month. The owner, Preservation of Affordable Housing (POAH), hired Skender to complete its fifth new construction project along Cottage Grove Avenue, regenerating acres of blighted sites with affordable housing. Woodlawn Station returned a blighted sight back to use and also will provide much needed affordable housing for the neighborhood. According to POAH, its investments and partnerships are having a dramatic impact on Woodlawn—the population has grown 15 percent (the first increase in decades), new jobs are being created, the number of vacant properties has plummeted and violent crime has fallen by 40 percent.